Ensuring the cleanliness of your solar panels ensures optimum performance. Build-up of dust or dirt significantly reduces the solar yield and your financial reward. We help you continue to recoup your solar investment at up to 30% faster by keeping your solar panels clean. Ask us about our discounted Solar Panel Maintenance Program. When your solar panels have been installed for over 12 months, efficiency levels are compromised. Dust, bird mess, industrial and agricultural debris accumulates on the panels needs removing to maximise the panels’ output. 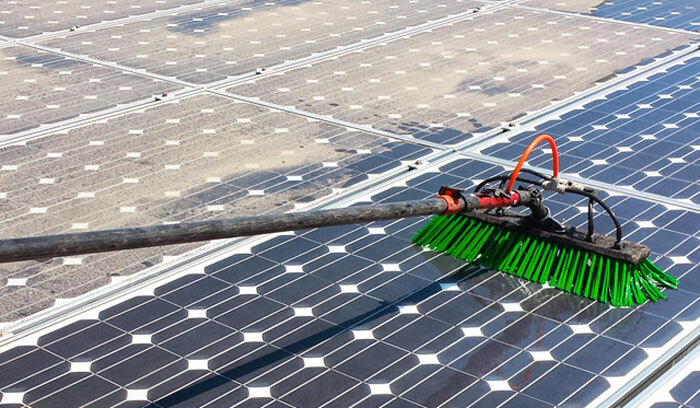 We have extensive experience cleaning commercial solar panels. Using specially designed brushes and purified water, we clean your solar panels ensuring they continue to deliver return on your investment. Did you know that dirt and dust reduce solar panel efficiency? A regular clean maintains output and avoids falling productivity. With the majority of residential solar panels located on roof tops, cleaning can be difficult and dangerous for homeowners. Our experienced solar panel cleaners use water-fed poles to reach several storeys high. So we can clean your solar panels safely from the ground. A highly cost effective and safe option to maintain your solar panels is combining this with your essential window and gutter clean. For a quote or more information please call 01392 964096. Dust, pollen and agricultural debris quickly builds up on solar panel arrays. Reduced efficiency in turn reduces the return on your investment. To ensure your expensive solar panels remain productive, we recommend a minimum of one clean, scheduled in the spring to maximise output in the summer months. Contact us today for a quote or further information on 01392 964096. We recommend at minimum of one annual clean in spring, to ensure your panels are free from any dust and dirt ready to make the most of summer. This will help maximise your solar panels’ efficiency and your return on investment. If the panels are in agricultural, seaside, traffic or industrial areas they may be susceptible to heavy levels of pollen, bird droppings and grime. In these cases, more frequent cleans are justified financially. We are always happy to advise on clean frequencies when we quote and can add in additional cleans as appropriate. Rain water contains impurities which leave behind a film on solar panels. This builds up over time. In the same way that rain does not sufficiently clean your car or windows, it also is inadequate to clean solar panels. Dust, debris, bird droppings and grime builds up on your expensive solar panel investment, leaving them running less efficiently. Regular cleaning schedules ensure higher energy output of your panels and the most cost-effective energy solution for your home or business. We use water-fed poles with brush attachments from a specialist manufacturer, designed to be soft enough to not damage the panels, but still clean them effectively. We use purified water which means no residue is left behind when the water dries.